Dec 30th 2012 - Skyfall becomes the first James Bond film to break a billion dollars at the worldwide box-office. Jan 27th 2012 - Skyfall overtakes Thunderball's inflation adjusted box-office to become #1 Bond film of all time. Daniel Craig's third outing as 007 in "Skyfall" has big shoes to fill at the box office. His first James Bond film "Casino Royale", smashed James Bond box-office records and brought in $594m globally, and the follow up "Quantum of Solace" performed fractionally better in the US but fell short overseas, taking a global total of $586m. "Skyfall" faces two challenges to become the biggest Bond of all time: hitting the ground running in the US after a two week gap after its release in Europe, and staying strong through its main box office competition - the final installment of the "Twilight" franchise - opening against it in its second week. No such troubles for 007 in most of the rest of the world, especially in the UK where it arrived to rave reviews and a crescendo of British feel-good factor in its 50th anniversary year. Also working in its favour is the release of the film in IMAX - a first for the James Bond franchise. Not only does this guarantee additional screens, but the higher ticket prices will also boost the coffers. MI6 projects that "Skyfall" will surpass "Casino Royale" totals and records at the UK and rest of the world box-office, and have a strong first week in North America. The film's second week performance in the US against "Twilight" will be key to the longevity of its box office run. 007 opening weekends are usually critic-proof, but "Skyfall" has enjoyed some of the best critical reception ever for the series, which is bound to boost attendances. The first ever IMAX opening will further enhance figures as will wider releases in new territories such as China. As of 3rd March 2013. The Royal World Premiere was held at the Royal Albert Hall in London, UK, on Tuesday 23rd October 2012. The 007 producers Michael G. Wilson and Barbara Broccoli took to the stage to thank the attendees. Wilson confirmed that the evenings proceedings raised £300,000+ for the Prince's charities. After the producers' comments, Mendes introduced his cast and thanked them. He concluded by noting that, "Tonight, Bond belongs to everyone." Special screenings were held in London the next day by the key commercial partners for the film, followed by dozens of regional charity premieres around the UK on Thursday 25th October. The film opened across the UK and Ireland on Friday 26th October 2012 at 587 cinemas in the UK, across more than 1,500 screens. That is quite a leap from the previous film, "Quantum of Solace" (2008), which opened across 1,150 screens in the UK & Ireland. Record-breaking "Casino Royale" (2006) was narrower still with just 988 screens on opening week. Weekend Commencing 26th October (Week 1) - "Skyfall" opened at the #1 spot in all of its initial 25 territories in its first weekend of release, and early estimates project an initial $80.6m take, of which an astonishing and Bond record breaking $32.4m will come from the UK alone. It's British bow is only second to the final "Harry Potter" installment which took $38.3m in its first UK weekend in 2011. Its UK opening is 30% higher than "Quantum", and 76% higher than "Casino". Sony said the film smashed the all-time Saturday attendance record in the U.K.
Outside of the UK, "Skyfall" took $9.1m in France across ~700 screens, $8.6m in Russia, $6.05m in South Korea for a 49% market share, $3.2m in Brazil (a Bond record), $2.7m in Norway, $2.6m both in Sweden and Denmark, $2.5m in Poland, $1.5m in Finland and $1.4m in Belgium in its Friday-Sunday weekend estimates. IMAX proved to be a catalyst for the record books, opening at 79 locations for an estimated $3.5m, which is roughly $45,000 per screen. The UK opening at IMAX was second only to "The Dark Knight Rises" in the record books. "This picture has such an incredible DNA and to be so loved by critics and audiences alike will push it be one of the biggest, if not biggest, Bond pics," Sony worldwide president of distribution Rory Bruer said. The film completed its first full week of release at #1 in all 25 of its opening territories, and clocked up $10.5 million in France, $8.3 million in Russia and $5.9 million in South Korea, representing nearly half of that territory's total marketshare for the weekend. "Skyfall" opened in Argentina, Germany, Italy and Mexico on November 1st. Weekend Commencing 2nd November (Week 2) - The records continue to tumble as "Skyfall" added an astonishing $156m in its second international weekend. The box-office total stands at $287m in just 10 days and major markets like the USA, Canada, China, Australia and Japan still to open. "Skyfall" broke opening weekend and opening week records, but its strength holding over in to its second week is bound to get the statisticians checking the box office history books too. In the UK, it took an amazing $25.7m in its second weekend, down just 20% on its opening. Contrasted to the usual blockbuster shed of 50% of audiences in a second week, "Skyfall" holding 80% of business has beaten even the wildest predictions. The UK total after 10 days stands at $85.8m and has already overtaken "Quantum of Solace" and is fast catching up on "Casino Royale" ($106m in UK, which was earned over 2 months). Bond will overtake Batman for the biggest UK release in 2012 later this week. Elsewhere in Europe, France added $14.3m in the second weekend to bring its total up to $30m, already beating "Casino Royale" and closing on "Quantum of Solace" records. "Skyfall" opened in Germany to $23.9m, which is the biggest in 2012 and 77% up on "Quantum". Italy opened with $7.9m and is also the biggest opening in 2012, up 95% on "Quantum". It didn't quite break 2012 records in Spain though, opening to $6.7m for the second biggest this year, up 27% on "Quantum". It became the biggest ever opening in Switzerland with a record $5.3m opening weekend. It also trounced 2012 openings in the Netherlands with $4.4m, more than 2.5 times the previous record and 91% up on "Quantum". Similarly in Austria, the film took $3.4m and doubled the previous record and is the second biggest opening in that country's history. Other countries that opened this weekend in the rest of the world included $3.2m in Mexico, $5.1m in India, $2.5m in Indonesia, $2.5m in Malaysia, $2.5m in Taiwan, $1.9m in Hong Kong and $1.8m in Thailand. IMAX continues to add significant numbers to the film's takings with $4.3m this weekend on 132 screens worldwide. The film will reach the half-way point of "Casino Royale"s record takings early this week, days before it opens in the USA and Canada, where a $100m opening is not out of the question. Other territories that have been kind to 007 recently such as Japan, Australia and China are still to come, too. Weekend Commencing 9th November (Week 3) - "Skyfall" added another $89m from 12,850 locations in 80 markets in its third weekend, setting itself up to become the highest grossing 007 adventure internationally (not taking in to account inflation). At the end of Sunday, its international total stood at $428.6m, just $3.6m short of the record holder "Casino Royale". This record will be broken on Monday 12th November. Sony and its distribution arm has taken $367.4m of the pot internationally, whilst MGM and its partners have accounted for $61.2m so far. The British end was held up with another amazing weekend of $18.2m from 1,786 screens, pushing the UK total to $117.5m and becoming the fourth highest grossing film in UK history. Its third weekend is still a 56% hold over from the record opening weekend, indicating that word of mouth is bringing new audiences to the film. The UK all time record is $150m held by Avatar - which must be in the sights of 007. Elsewhere in Europe, Germany added $15.1m from 1,338 screens in its second weekend (a 63% hold over) to a total $44m. Next door in France, its third weekend added $8.2m across 825 screens, to a national total of $42.5m. Both countries will have broken their Bond records by next weekend. The international box-office for "Skyfall" continued its sensational performance this weekend by adding an amazing $49.6m. It's internationally tally now stands at $507.9m and sets all previous Bond outings in the shade, not taking inflation in to account. The film stands to make more at the international box-office than previous record holder "Casino Royale" did including USA & Canada. A total worldwide take of $800m+ now seems certain. It was German fans who 'kept the British end up' best with a third weekend of $10.3m. Back home in the UK, "Skyfall" added another $8.9m in its fourth weekend to a total of $133.4m in the country. The all-time UK record of $150m held by "Avatar" is getting ever closer. "Skyfall" opens in Australia and New Zealand next week. "Skyfall" had another strong weekend around the world as it added $41.3m to its international haul (this figure was only for Sony distributors as MGM were late in reporting). The total in Bond's homeland now stands at $144.5m is will become the UK's highest grossing film of all time when it overtakes "Avatar"s $150m later this week. They had to wait longer than most, but James Bond fans in Australia have packed cinemas across the country as "Skyfall" finally opened this weekend when it raked in an astonishing $12.304m on 595 screens in its first weekend Down Under, which smashes the previous record of $7.954m held by "Quantum of Solace". It is also the biggest opening weekend of all time for Sony Pictures Releasing Australia. Last time around, "Quantum" made $20.6m in Australia, but "Casino Royale" made more: $25.4m despite a smaller opening weekend of $5.408m in 2006. "Skyfall"s opening weekend haul has placed it in the top 20 openings of all time, ahead of "Avatar" ($11.99m) and "Twilight Breaking Dawn – Part 1" ($12.1m). However it narrowly failed to break through the all-time Australian opening records set by "The Avengers" ($13.28m) and "Twilight Breaking Dawn Part 2" ($12.49m) - which bowed a week before "Skyfall", the opposite of the USA release schedule. It is expected that "Skyfall" will make over $30m in Australia. On IMAX, "Skyfall"s global total to date has reached $49m ($7.5m from the US & Canada). The Sony worldwide figure for international box-office currently stands at $568.4m (this will increase when MGM territories report). The film already holds the worldwide box-office record for the 007 franchise, but when taking inflation in to account, it still has a few more rungs on the ladder to climb. Combined with the US & Canada, the total haul will be pushing close to $900m with Japan and China still to open. "Skyfall" will easily overtake "Live And Let Die" for the #3 all-time spot. Next stop: Goldfinger and then the magic $1b mark. With over a month on release, "Skyfall" added another solid $34m in its fifth weekend internationally. For the second week, Australia was the most lucrative country with an impressive $7.727m across the nation in its second weekend, down 41% from its debut of $12.304. With $25.9m in the bank in just 10 days, "Skyfall" has already surpassed the Bond record Down Under of $25,391m held by 2006's "Casino Royale". "Skyfall" took £2.3m over its 6th three-day weekend on release in the UK to regain the #1 spot and build an enormous total of £93.8m. The UK total is now within days of overtaking "Avatar"s £94m as the all-time highest grossing film at the British box-office. South Africa opened to an impressive $788,523, up 35% on the previous debut weekend take held by "Quantum of Solace". Japan, its penultimate major territory, opened to a debut two-day weekend of 455 million yen ($5.5 million). "Skyfall" opened on 584 screens (355 subtitled, 229 for dubbed) and saw 252,000 admissions on Saturday and 147,000 on Sunday. Its performance was 69% better than "Casino Royale" and 49 % bigger than "Quantum of Solace". It is expected that Japan will contribute approximately $20m-$25m to the international total which currently stands at $623m ($869m with the USA & Canada). Next week, "Skyfall" opens in the Dominican Republic (it may break 6-digits and a new record), its final bow for 2012. The global total, aside from China which awaits in February 2013, is expected to reach $950m globally by the end of the year. "Skyfall" added $20.3m from 84 international territories over the weekend to a total of $656.6m. This places it 4th in the all-time international gross of 2D movies behind "Titanic", "The Lord of the Rings: The Return of the King" and "Harry Potter and the Deathly Hallows Part 1". Combined with the haul from USA & Canada, its worldwide total stands at $918m with all eyes on the $1b mark, which if it can't make by creeping slowly over the holiday season, will surely break though when released in China in early 2013. Down Under it held the #1 spot in Australian with a third weekend take of $4.8m, breaking the Bond record at the Aussie box-office with a total of $33.5m. In Japan audiences dropped 40% to a weekend total of $3.3m for a total of $13.2m after two weeks. Germany added another $2.4m in its 6th weekend to a total of $74.7m. The film is still #1 in Holland, dropping just 29% and adding $1.1m to its total of $19.1m. Over the channel in France, "Skyfall" added another $1.0m to its total of $56.5m. Back home in the UK, it's total now stands at $154.5m. It added £1,428,708 from 513 sites to its record total of £96,333,036, but narrowly lost its #1 spot to animated family film "Rise of the Guardians" which took £1.4m. Another record fell this week as "Skyfall" became Sony's best performing film at the international box-office, surpassing "Spider-Man 3"s worldwide total of $890.8m. "Skyfall" crossed the $950m mark at the worldwide box-office this weekend as its march to the once unimaginable but now inevitable $1b total continues. It also became the 18th highest grossing film of all time this week. Taking inflation in to account, "Skyfall" overtook "Goldfinger" to become the second most successful 007 movie of all time, and has the #1 spot held by "Thunderball"s $1.03b in its sights. $20.3m was added to the International total for "Skyfall" this weekend to a total of $656.6m (not including USA & Canada). I lost its #1 spot in every country where "The Hobbit" opened this weekend, although Peter Jackson's latest epic failed to beat "Skyfall"s opening weekend in most countries. At home in Britain, "Skyfall" dropped to #4 after two months on release, but still added £809,406 from 434 sites to a total of £97,897,404. "Skyfall" added another $9m from international territories this weekend (21st-23rd December 2012). In the UK, the 23rd 007 adventure took another £554,958 in its 9th week, edging ever closer to the astonishing £100m mark. It is already the most successful film of all time at the UK box office. Although it slipped to #6, the first time out of the top 5 since its release, holiday audiences may help boost next week's total despite the slew of new releases. Down Under, "Skyfall" broke the $40m mark in Australia. It lost the number #1 spot, which it had held for over a month, to the opening of "The Hobbit". "Skyfall" has become the most successful James Bond film ever in France. The French box-office reports this week confirmed that 6,682,000 tickets for "Skyfall" have been sold in the country. The previous record was 6,675,000 held by "Goldfinger" back in 1965 (it was released a few months after its UK debut of September 1964). Unsurprisingly, "Skyfall" is also the most successful film at the French box-office in 2012. It is still on release in the country and will add further tickets over the holiday season. Adding in its domestic (USA & Canada) performance, "Skyfall" has earned $974.3 million worldwide. "Skyfall" is now the 9th highest grossing film of all time at the worldwide box-office. December 30th 2012 will go down in 007 history as the day a James Bond film first crossed the $1b global box-office mark. With estimated returns being processed by Sony, MGM and their distributors, the running total for "Skyfall" reached $1,000,200,000. "Skyfall" becomes only the 14th film in history to break the billion dollar target. The 23rd James Bond film is just $4.4m shy of beating the worldwide total for "The Dark Knight", a feat which was unimaginable back in October. Even more impressive is the fact that it took Batman 33 weeks to clock up that total, whereas 007 has done it in just 10. With China still to open next month, it is entirely possible that "Skyfall" will overtake "Thunderball" as the most successful 007 adventure of all time. Connery's underwater outing took an inflation adjusted $1,037.2m. (Press Release) Skyfall, the 23rd James Bond adventure, has surpassed $1 billion at the worldwide box office, it was jointly announced today by Jeff Blake, chairman of Worldwide Marketing and Distribution for Sony Pictures and Gary Barber, MGM's Chairman & CEO. The film, from Albert R. Broccoli’s EON Productions, Metro-Goldwyn-Mayer Studios, and Sony Pictures Entertainment, is the most successful Bond film of all time. It is the highest-grossing film of all time in the UK, the first film to pass £100 million ($161.6m) at the UK box office. It is also the most successful film at the worldwide box office in Sony Pictures history. Skyfall took in $4.6 million this weekend in North America for a cume to date of $289.6 million. Overseas, the film grossed $10.3 million for an international total to date of $710.6 million and a worldwide cume exceeding $1 billion and growing. "It is truly thrilling to reach this incredible milestone. With tremendous gratitude to Barbara and Michael, Sam, Daniel and our partner Sony, and to all of the dedicated distributors and fans across the globe, we are so proud of both Skyfall and our 50 year association with James Bond," said Gary Barber, MGM's Chairman and CEO. Commenting on the announcement, Blake said, “To see a film connect with audiences is always gratifying but the success of this film is nothing short of extraordinary. After 50 years of entertaining audiences all over the world, Skyfall is the most successful James Bond film of all time. We couldn't be more excited for Michael Wilson, Barbara Broccoli, Sam Mendes, Daniel Craig, and especially the fans who put James Bond in this very rare and very exclusive billion dollar box office club. On the other side of the globe, the film took over $1m in Australia in its seventh week to an eye-watering total of almost $48m. "Skyfall" fell out of the UK top 10 for the first time since its release, down to #12 with a weekend take of £222,507 from 142 cinemas. Although box-office results are still to be formalized, the USA & Canada early reporting as pushed "Skyfall" to a worldwide total of $1,032.9m, which puts it in striking distance of becoming the highest grossing James Bond film of all time taking in to account inflation. The record holder, "Thunderball", took $1,037.3m based on 2012 inflation calculations. With China still to open on January 21st, "Skyfall" is sure to take the #1 spot next week then pull away to remove any margin of error. It seems there were still some people left in the UK who had not seen "Skyfall" yet, even after 3 months on release, so it added another £84,738 from just 92 cinemas this weekend (the national total now stands at £102,255,506). After the weekend was over, "Skyfall" became the 11th highest grossing film at the worldwide box-office of all time. "Skyfall" opened in China on Monday 21st January 2013 on 5,500 screens. This made it the widest release yet in China, although as the country opens new cinemas every day, this record will probably be short lived. The opening day box-office is reported to be between $4.8m and $5.1m. "On its final stop on a remarkable journey, "Skyfall"s long-awaited China opening does not disappoint," a Sony insider told The Hollywood Reporter. "Skyfall" opened 14% ahead of last summer's "The Dark Knight Rises", which also opened on a Monday on its way to grossing $50 million in China, and did almost three times the business that previous 007 film "Quantum of Solace" did on its first day in 2008. "Skyfall" earned 112 million yuan, the equivalent of $17.9 million in USD in its first three days, becoming the highest grossing Bond film in China. In the same period "Casino Royale" took 92 million yuan. After its first seven days, the Chinese total stands at $34.4m (9% up on the same period for "The Dark Knight Rises"). Thanks to the Chinese opening, "Skyfall" ($1,077.8m) now stands as the 8th highest grossing film at the worldwide box-office of all time and has overtaken inflation-adjusted "Thunderball" ($1,037.3m) as the #1 James Bond film of all time at the box-office. The only major territory left with significant revenues is China, which this week added $16m to bring its total Chinese haul to $50.9m. "Skyfall" impressed to hold off "Cloud Atlas" which only scooped $11.3m in its opening week. Industry watchers expect "Skyfall" to finish north of $60m as the revenues will slow down with the influx of other Hollywood outings in the coming weeks. For the record, "Skyfall" is still on release in the UK and brought in £33,397 over 49 cinemas and ranked #27 in its 15th week. "Skyfall" became the 7th highest grossing film of all time (unadjusted) by reaching $1,094m and beating "The Dark Knight Rises" ($1,081m) down to #8. The next rung up the ladder, "The Lord of the Rings: The Return of the King", will be out of reach with its $1,119m total. Despite waiting two weeks longer than most of the world, and a Presidential election sucking the oxygen out of commercial television promotion in the run up to release, "Skyfall" did not disappoint in its opening weekend taking an estimated $87.8m - smashing industry predictions of $78m. $2.4m of Friday's total was midnight screenings late on Thursday night. In addition, the film opened a day early exclusively in IMAX and added a further $2.2m to its total. Across the weekend, IMAX accounted for $13.1m, or 15% of the total four day take. As with almost all the countries that has seen "Skyfall" so far, the opening weekend take is a record for the franchise, smashing Craig's previous height of $67.5m for "Quantum of Solace". The opening is the fourth highest of 2012 in the USA & Canada, behind "The Avengers", "The Dark Knight Rises" and "The Hunger Games". Boding well for ongoing business is the fact that 75% of "Skyfall"s audience was over 25, which means that long-term Bond fans are turning out, compared to only 58% for "Quantum". The last episode in the "Twilight" juggernaut opens next week. Critical approval and a CinemaScore of 'A' for "Skyfall" lead industry watchers to predict a minimum $200m take, with a stretch goal of $250m for Bond. "Skyfall" managed to hang on to all of its 3,505 screens in its second week of release in the USA and Canada despite the last outing in the juggernaut "Twilight" franchise making its debut this weekend. The vampires failed to break their series record but still scooped an estimated $141.3m weekend. Audiences for "Skyfall" were down 53% from its opening weekend, which is inline with industry averages for blockbuster releases. This is better than the last outing, "Quantum of Solace", which shed 60% of its audience on the second weekend. "Skyfall" took $41.5m (estimated) in its second weekend to a total of $161.3m domestically, and it will eclipse "Quantum" as the most successful 007 entry in North America by mid week. 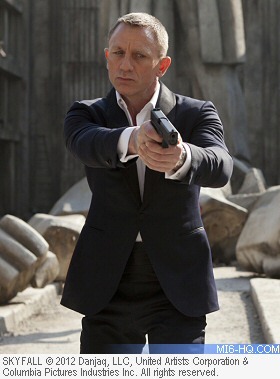 Judging by the performance of Craig's first two Bond films, "Skyfall" looks set for a $250m haul in USA & Canada. "Skyfall" easily kept its #2 position at the US box-office this Thanksgiving holiday with an amazing take of $35.5m for the standard 3-day weekend, its third on release. To put things in to perspective, that's almost how much "Casino Royale" made in its opening weekend, and "Skyfall"s 3rd weekend ranks #6 on the 'all-time 3rd weekend' list at the domestic box-office, just pipping the "The Dark Knight Rises". Over the longer 5-day holiday period, "Skyfall" racked up $50.5m taking its domestic total to $221.1m. "Skyfall" also enjoyed a great start to this past week, taking $4.0, $5.6m and $7.4m on Monday, Tuesday and Wednesday respectively. Its third weekend was a drop of just 12% on the previous week, compared to "Twilight" which shed almost 70% of its audience in its second week. Only $6m stands between the total takes "Skyfall" and "Breaking Dawn Part 2", so it will be interesting to see which franchise has the stronger legs as the screen counts decrease. Industry watchers expect its total will surpass $270m in the end to overtake Sony's "The Amazing Spider-Man" and will become the 4th or 5th highest grossing film of the year in USA & Canada. 007 kept pace and only missed the #1 spot by less than a million dollars as "Skyfall" had another head-to-head weekend with "Twilight", which has been on release a week less. "Skyfall" took $16.55m over the three day weekend and only dropped 60 engagements in its fourth weekend, down to 3,463 screens. "Twilight" took $17.41m and dropped 62 screens to 4,008. The week after Thanksgiving is traditionally a dumping ground for new releases deemed to have poor chances at the box-office, and 2012 was no exception. Brad Pitt's new R-rate crime thriller "Killing Them Softly" slumped in at #7 with just $7m in its opening weekend. Horror movie "The Collection" flopped worse with just $3.4m. "Skyfall"s total in the USA and Canada now stands at an astounding $246m, and this week become the #1 spy movie in domestic box-office history (overtaking "The Bourne Ultimatum"s $227m). Both "Skyfall" and "Twilight" might have another week of solid business coming up, as there are few new releases which will threaten their take. It was a a tight race, but "Skyfall" came out on top in its fifth week of release against fellow holdover movies "The Twilight Saga: Breaking Dawn Part 2" and "Lincoln" - both of which were released after 007. Although "Skyfall" dropped 35% on last weekend, it still took a solid $10.8m from the three-day weekend in USA & Canada to bring its total 'domestic' haul to $261.6m. "Rise of the Guardians" took $10.4m in second to beat "Twilight"s $9.2m in to third place. The only major new release was Gerard Butler starring rom-com "Playing for Keeps" which flopped to #6 with only $6m. "Skyfall" became the first movie to regain #1 spot in its 5th week on domestic release since "How to Train Your Dragon" managed the feat in April 2010. 007 lost a few engagements from 3,463 the previous weekend to 3,401 screens. "Skyfall" opened in 3,505 theatres on opening weekend. Above figures include Canada. † The film opened a day early exclusively at IMAX on Thursday 8th November and these takings did not count towards the opening weekend. "Skyfall" had resided at #1 at the US box-office for the previous 10 days in the run-up to this weekend despite having been on release for a month and other major films such as "Twilight" and "Lincoln" competing. The tent-pole release of "The Hobbit" on Friday meant it would quickly be moved out of the top spot this weekend. But Peter Jackson's first of three parts Tolkien adaptation could not beat 007's opening weekend this year as "The Hobbit" only took $84.8m, almost $4m short of "Skyfall"s record. Despite being released in 500 more screens than "Skyfall" in its opening weekend, and higher ticket prices for 3D, "The Hobbit"s performance is likely to have been affected by poor reviews and much criticism of its use of the new 48 frames per second digital format. Jackson's film is lingering at 60% on review aggregator Rotten Tomatoes, whilst "Skyfall" is still riding high at 92%. 3D screenings of "The Hobbit' accounted for approximately 50% of its box-office take, so attendance would be considerably lower than "Skyfall" even if it had matched the dollars. "Skyfall" took $1.82m on Friday (down 41% on the same day last week), $3.04m on Saturday (down 39%) and $1.69m on Sunday (down 35%) for a total three-day weekend of $6.55m landing (narrowly) behind "Lincoln" ($7.0m) and "Rise of the Guardians" ($7.1m). "The Hobbit" finished up with $84,617,303. The number of engagements for "Skyfall" fell to 2,924 in its sixth week. "Skyfall"s US & Canada box office now stands at $272.3m, and looks set to head north of $290m domestically by the end of the year. "Skyfall" has proven that James Bond has better legs at the US box office than the "Twilight" franchise as the latest 007 adventure has overtaken the box-office haul of "Breaking Dawn Part 2" after 49 days on release. 007 is pulling in more than double the vampire's take every day at the box office this week, and has been rewarded by theatre owners by keeping more screens 2,365 versus 2,000. This weekend, "Skyfall" added another $4.7m, taking the domestic tally to $279.97m. The film slipped -28.3% from #4 last week to #8 due to the number of new releases. Sony did not release daily figures for Christmas Eve and Christmas Day, but the combined take for those two days was an estimated $2.4m. The domestic total currently stands at an estimated $285,025,000 and is the 4th highest grossing film of the past year in the USA and Canada. After two months on release, "Skyfall" slipped out of the domestic top 10 for the first time, falling from #8 to #11 with an estimated weekend haul of $4.6m. Despite losing 728 screens to 1,637 engagements, the weekend is only 2% down on the previous week. The holiday season typically attracts non-regular cinema goers who take advantage of the Christmas period to catch up on movies, and this has no doubt helped Bond maintain its pace against the slew of new releases. Indeed, going by per-screen average takings, it would be back at #8. The current USA & Canada total stands at an estimated $289.6m as 007 rings in the New Year. By early January it is set to cross the $300m mark, beating even the wildest industry projections. In the run up to the weekend, "Skyfall" enjoyed $1m+ hauls on Monday and Tuesday. But week 9 saw 'Skyfall' drop to #13 in the US & Canada weekend box-office with a take of $3.07m (a 22% drop on week 8) over 1,307 screens (a drop of 330), bringing the domestic haul tantalizingly close to $300m at $296.8m. It will certainly break the $300m by the middle of January. But with a slew of new Oscar contending releases due next week, there will likely be a sharp fall off for mid-week business going forward. The inevitable slide down the charts began this week due to some high profile new releases and Sony's Oscar favourite "Zero Dark Thirty" going wide. Each mid-week day scooped under $250k for the first time. At #17, "Skyfall" took $1.57m (down 48.9%) over the weekend across 823 screens (a drop of 484 from last week). If the previous two Daniel Craig 007 films are anything to go by, Sony will probably pull the movie from distribution when the daily take drops to below $50,000, but that may take a couple more weeks yet. "Skyfall" dropped to 20th at the US & Canadian box office with a weekend take just shy of a million ($969,241) on 507, a drop of 316 since the week before. On Sunday night, actuals put the domestic haul at $300,856,315 - nearly double that of "Casino Royale" and "Quantum of Solace". "Skyfall" is now the 41st highest grossing film at the US box-office of all time. Studio estimates from Sony are not available for "Skyfall", but it is expected to haul somewhere in the region of $400,000 (roughly the same as its 4-day week day run) after 77 days on release and a rapidly shrinking screen count. "Casino Royale" started to disappear from mid-week screenings after the same time on release, switching to a limited weekend only screenings. But as the "Skyfall" Blu-Ray and DVD is coming out on February 12th, there will just be days between its last screening and it hitting store shelves. For the first time since release three months ago, 'Skyfall' did not screen mid-week. This is typical of a major release as it runs its final lap at the nation's cinemas. For its 13th weekend, and last before the film is available On Demand (iTunes and Amazon Instant launched on February 4th), "Skyfall" still pulled in $526,926 across 425 screens and fell just one place to #23. With the DVD & Blu-Ray retail launch on February 10th, next weekend is probably the last before Sony pulls it from distribution.